The teasers are here for November 2018 tvN fantasy romance drama Memories of Alhambra and my first impression is that it’s totally got the exact vibe as Goblin. The location shoot European architectural visuals, with Spain for Alhambra and Quebec City for Goblin, and the leads meeting on a hilltop vista with the backdrop of the old city beyond them. 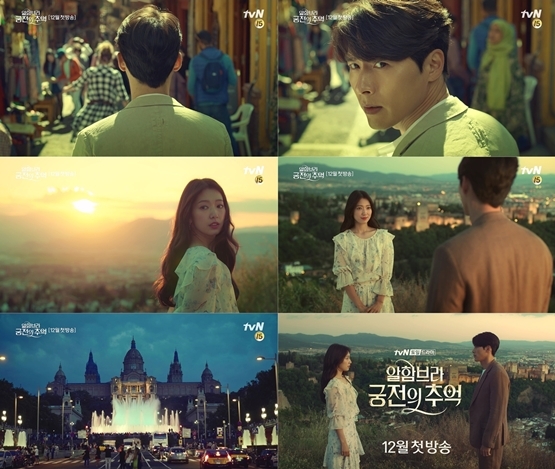 It’s an effective and captivating promo for sure, worked well with Goblin and works well here to showcase Park Shin Hye and Hyun Bin in Alhambra. She’s beautiful, he’s handsome, and both have wildly popular fandoms and high profile star status in Korea, it’s going to be up to the story to bring more to the table than just the pretty. I want to sigh and laugh and cry and be all roped into their romance. Can’t wait for the final product to be here. Cinematography and visuals are amazing so far. Can’t wait… November feel so long. Both look georgeus, and eager to see how romances develop between Park Shin Hye and Hyun Bin. Dam November and December seem to take forever, I’m dying to see my Hyun Bin. He look so handsome and Park Shin Hye is pretty. Hwaiting my man. It will be airing on the 1st of December 2018, not November. Can’t wait for Shin Hye’s bombastic collaboration with Hyun Bin. Its no longer airing in November but December 1st after 9 Rooms,and that’s after Mr Sunshine. This is the very first teasers. TVN would actually show even less. The real teaser might surprise people. I miss her! Please be good drama! i’m glad major part of people don’t think like you. And you never know, people can always improve themselves and change people mind. No one is begging you to watch nor care either. Keep it for yourself because millions people are waiting for her projects and those are more than enough. Hyun bin has flop drama like world within and hyde jekyll me. Park shin hye better than him. For us Park Shin Hye fans it’s a Xmas gift! It’s been a long time since we’ve seen her in a drama. Wished she’d be more greedy and accept a project as often as possible… btw, that’s sarcasm. She chooses projects that speaks to her and what makes her happy. Hope it does gang busters in the ratings too! Be good drama. Yes yes and millions more yes. MOA is finally around the corner and I really can’t wait to see more of my two super stars PSH and Hyun Bin. Fingers cross , all negativity out, power to positivity , and a lot love, good aura surround my Shin Hye , Hye Bin, and this drama Memory of Alhambra. I am so happy it will show on the Netflix at the same time. International investors already digging into it to get a piece of the pie, saling before it is even out . Indeed, high expectations and many prayers , God’s project. Fighting ! Apparently. HB doesn’t know what the final product looks like because it’s a different concept of filming the drama so I expect the unexpected. Can’t wait!